Posted by judylobo in Baby Animals, Mammals, photography, Snow Monkeys, Wildlife, Zoo. Six Zoos in Six Days – this year’s zoo-cation was a delight. My plan is to send out one montage per day for the next six days. Our first stop was to the NEW ZOO in Green Bay, Wisconsin. Why the NEW ZOO you ask? 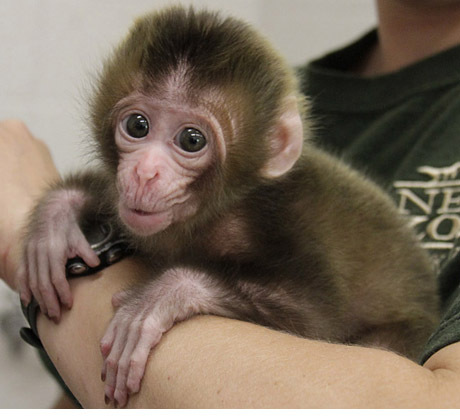 The Central Park Zoo‘s snow monkey, Manny, moved to Green Bay a few years ago. Manny, now 10, sired two adorable babies and we just had to go visit him and the new arrivals. He is surrounded by nine females and seems to be in monkey heaven. The zoo keepers were very generous with their time and we had a terrific visit. For more info on these two new arrivals you can read from their website here. What is my dog Kaiya doing in the Green Bay, Wisconsin Zoo?